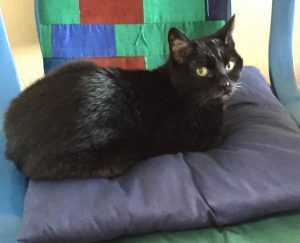 Raven is a petite, 12-year-old, de-clawed black beauty with a BIG heart. 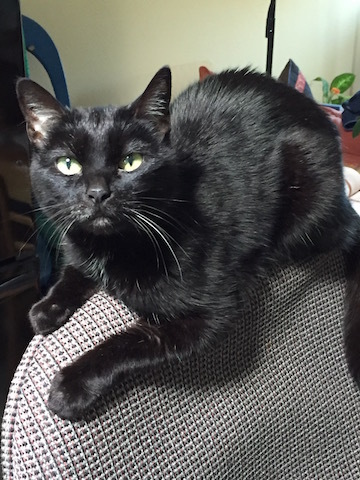 Raven enjoys perching–in a window, on the top of a chair, on pillows, on her kitty bed, and most of all, on laps. With her special kitty radar, she knows when her foster mom is heading for her recliner to read or meditate and she’s there in a flash. Snuggling in bed is also on her list of favorite things. Raven is a talented talker who gives very specific instructions while her breakfast and supper are being prepared. She also gives critiques when dogs walk by and is somewhat curious about the whole collar/leash ensemble they wear. Raven warms up to new people quickly, but she will never be friends with the vacuum cleaner. She grooms often so her fur is soft and shiny. She seems comfortable around cats, dogs, and everyone she meets. Raven’s sweet, easy-going nature makes her the “purrfect” roommate. Raven is currently living in a foster home, so please fill out an application if you are interested in meeting her. She comes to you fixed, vaccinated, micro-chipped (and with a recent dental and bloodwork!) for an adoption fee of $80.